Its been a while since the last post. I’ve been working on the stack VM and the closure bootstrap. But its high time I posted more of the closure implementation. Apologies for the delay. In the post before last we saw the closure design in Cog and its prototype implementation above an unmodified VM. This post looks at the opcodes used to implement Closures in the image. The image level implementation is in InsructionStream, ContextPart and MethodContext is used by the debugger and some of the image-level browsing facilities. The next post will probably present the VM implementation. self do: [:each | indirectTemps at: 1 put: (binaryBlock value: (indirectTemps at: 1) value: each)]. So let’s implement this with bytecodes, so that we can bootstrap closures in something close to the current VM, something that will run both the existing system and a system recompiled to use closures. Before we do so we need to digress a bit on bytecode set design. – and that bytecodes exist to ensure all opcodes have large enough ranges to implement the system without restriction. Push Receiver Variable has both high dynamic frequency (how often an opcode is evaluated) and static frequency (how often an operation occurs in methods). Most objects have few instance variables. In my Croquet image only 20% of classes (ignoring metaclasses) have more than 15 instance variables. So there is both a high static and high dynamic frequency of pushing instance variables with a small offset. Hence the design above where there are 16 one-byte bytecodes to access the instance variables with offsets 0 through 15, a two byte bytecode that can access instance variables with offsets 0 through 63 and a three byte bytecode that can access instance variables with offsets 0 through 255, the maximum imposed by a class’s instance format word (the largest class in my image has 139 instance variables). Interpreting the short forms 0-15 0000iiii Push Receiver Variable #iiii is a lot quicker than interpreting the longer forms. One piece of code I ran to measure the sizes of bytecoded methods in two images, one which used only the long-forms and one which used the shortest forms available, ran 40% slower in the image which used only the long forms. So the game in designing a bytecode set is to divide up the available bytecode space amongst the opcodes to achieve a compromise between dynamic and static frequency. In practice optimizing on the basis of static frequency is a good heuristic since static frequency is a fair predictor of dynamic frequency. But the design of a bytecode set for the closure system is something that can wait until we’ve bootstraped the closure system and can start to perform some measurements. The first order of business is to bootstrap closures in the existing Squeak VM. To do that we need to find room. Only if we can’t find room do we need to make room. Luckily, the existing Squeak VM has 8 unused bytecodes, and that’s more than enough. We’ll use 5 of the 6 experimental bytecodes. These aren’t generated by the compiler (and implement an optimization we hope to outdo). We don’t have many to play with so we can’t do much space optimization. Because we only have 6 and each opcode needs at least one index we’ll have to use multi-byte encodings and include the indices in trailing bytes. Here are all 5 bytecodes. We’ll go through each separately three times. First we’ll define the bytecodes. Then we’ll implement them in the image’s execution simulation machinery, which we can use to test the bytecode before we generate a VM, and which is used by the debugger and also by the printing machinery that disassembles methods. lastly we’ll go through the VM code. 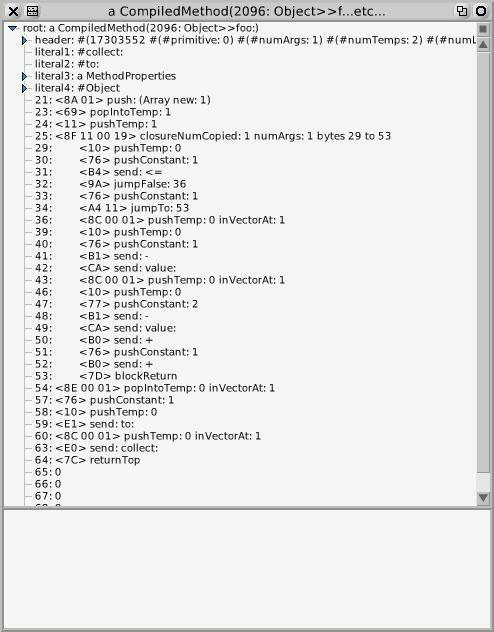 The first opcode can be used to create indirect temp vectors. Because Squeak stack frames are limited in size (50-ish slots) we don’t need to be able to create an Array with 265 elements. We can make our bytecode more useful if it can either create a new Array initialized with nils or initialize a new Array with elements popped off the stack. and more flexible because brace expressions can have any number of elements. The existing Squeak compiler compiles brace expressions with up to 4 elements as sends of braceWith:[with:[with:[with:]]]. e.g. Question, why does the compiler limit itself to only 4 elements max? The top bit of the following byte (bit j in the specification) is set and indicates popping 4 elements off the stack into the new array. The VM already knows the class Array because it is used e.g. in doesNotUnderstand: processing. We save 8 bytes by not having to have the literals for the class Array and the message selector #braceWith:with:with:with: in the compiled method. We save a further byte avoiding the pushLit: instruction. And of course the bytecode is much quicker to interpret than the old code. We’re saving time and space. Way to go. We could have designed the bytecode to include the offset of the local into which we want to store the new array since in our compiler Push (Array new: kkkkkkk) is always followed by a popIntoTemp: n. But since there can currently be up to 32 locals we’d either be limited in the size of the array or use a three byte bytecode. Neither of these is a win. A bytecode that does both Push (Array new: kkkkkkk) and Pop kkkkkkk into: (Array new: kkkkkkk) is more flexible and just as compact because we frequently get to use the short-form for the following popIntoTemp. and the closure compiler limits itself to 8 elements before using the stream implementation. Now the Push Temp At m In Temp Vector At: n opcode. In a moment of weakness I decided to go for a short-form here. This fetches the local at offset j..j on the stack and push the k..k’th element in it. whereas the pop form gets used in the store into var. The final bytecode is more interesting. This creates a closure, initializing it from the arguments and the current context. Because I’m doing The Simplest Thing That Could Possibly Work this is very closely modelled on the old BlockContext scheme. We don’t use a separate method for the block’s code. Instead we embed the code for a block within the code for its enclosing block or method. This has pros and cons. Its arguably more compact because blocks and methods get to share literals if they access the same ones, and because there is only one CompiledMethod object, but this is offset by the fact that we will need larger ranges and hence more long-form bytecodes to access the literals because the CompiledMethod’s literal frame contains the literals for the method and its blocks. The bytecode set has short forms for push -1, 0, 1 and 2 where you see <76> being used above but if a block has more than 2 arguments then we need 4 bytes for the literal as well as the push. But we’ll say that creating a block costs 5 bytecodes. One problem is that the long jump only has a 10-bit range so we can’t have blocks with more than 1023 bytes of bytecode in them. Collapsing these 4 separate bytecodes down into 1 multibyte code saves time and space, and easily allows a 16-bit jump size. We’ve gained a byte. The above looks worse (its our old friend Collection>>inject:into: which uses those bulky indirect temp bytecodes). In the common case we save, but any savings are offset by the bytecodes to push copied temps. We’ll gather full measurements in the next post. This all revolves around InstructionStream which is the class that manages the interpretation of bytecoded methods at the image level, the image’s dual of the VM itself. "Return Top Of Stack bytecode." "Duplicate Top Of Stack bytecode." "Remove Top Of Stack bytecode." "Remove Top Of Stack And Store Into Literal Variable bytecode." "Remove Top Of Stack And Store Into Instance Variable bytecode." "Remove Top Of Stack And Store Into Temporary Variable bytecode." "Push Active Context On Top Of Its Own Stack bytecode." "Push Constant, value, on Top Of Stack bytecode." "Push Contents Of anAssociation On Top Of Stack bytecode." "Push Active Context’s Receiver on Top Of Stack bytecode." is the argument, offset, On Top Of Stack bytecode." argument, offset, On Top Of Stack bytecode." "Store Top Of Stack Into Literal Variable Of Method bytecode." "Store Top Of Stack Into Instance Variable Of Method bytecode." "Store Top Of Stack Into Temporary Variable Of Method bytecode." offset = 7 ifTrue: [^client doPop]. offset = 8 ifTrue: [^client doDup]. offset = 9 ifTrue: [^client pushActiveContext]. byte2 := method at: pc. pc := pc + 1.
ifFalse: [client pushConsArrayWithElements: byte2 – 128]]. offset = 11 ifTrue: [^self error: ‘unusedBytecode’]. byte3 := method at: pc. pc := pc + 1.
offset = 12 ifTrue: [^client pushRemoteTemp: byte2 inVectorAt: byte3]. offset = 13 ifTrue: [^client storeIntoRemoteTemp: byte2 inVectorAt: byte3]. offset = 14 ifTrue: [^client popIntoRemoteTemp: byte2 inVectorAt: byte3]. byte4 := method at: pc. pc := pc + 1. "Remove Top Of Stack And Store Into Offset of Temp Vector bytecode." , ‘ to ‘, (scanner pc + blockSize – 1) printString. "Push Cons Array of size numElements popping numElements items from the stack into the array bytecode." "Push New Array of size numElements bytecode." "Push Contents at Offset in Temp Vector bytecode." Then we have to implement them in ContextPart, MethodContext and BlockContext, the three classes that define the image-level interpreter. The debugger uses these definitions to simulate execution. it into an offset in one of my local variables being used as a remote temp vector." new BlockClosure for the following code"
[copiedValues := Array new: numCopied. array := Array new: numElements. array at: i put: self pop]. in one of my local variables being used as a remote temp vector." an offset in one of my local variables being used as a remote temp vector." This level is suitable for prototyping bytecodes. We can test real methods using the above definitions before we attempt to build a VM. Here’s an example I used to do just that. runSimulated: is the entry-point into the execution simulation machinery. nfib := [:i| i <= 1 ifTrue:  ifFalse: [(nfib value: i – 1) + (nfib value: i – 2) + 1]]. generate: #(0 0 0 0)). Using this one can test a new set of bytecodes entirely at the image level using the Smalltak debugger to fix problems; a little easier than descending into the VM. Once InstructionStream, ContextPart, MethodContext and BlockContext changes are in place one has a good specification for the VM implementation proper in Interpreter. The Squeak VM is implemented in an unusual way. It is written in a subset of Smalltalk called Slang which is subsequently translated to C via the VMMaker. The C code is then compiled to create the actual VM. But the Slang code can be executed with a real Smalltalk image to allow debugging the VM in Smalltalk. This is pretty cool and I’ve been using it a lot recently to create the Stack VM, of which more in subsequent posts. Not everything works. Some plugins do not (yet) function when run in Smalltalk. So one can only debug the VM so far. But in working on the Stack VM I was able to execute the first 195,000 bytecodes in Smalltalk and got a lot of the code working before having to go to C. Very nice. So implementing the closure bytecodes in the Interpreter VM actually involves modifying the Slang Smalltalk code in the class Interpreter in the VMMaker package. VMMaker isn’t in a normal release image. You’ll have to download VMMaker, e.g. from SqueakMap. If you’re not familiar with VMMaker please use Tim Rowledge’s page above as a starting point. I’m not going to reiterate that information here. And of course you can still read the code without producing your own VM. – tell the VM where to find class BlockClosure and what is its layout. The latter two tasks are done by modifying methods on the class side of Interpreter. There are methods two that define the bytecode and primitive tables. I’ve elided much of the code for clarity. The changed entries are for bytecodes 138 through 142 and 143 and for primitives 200 through 229. Along with the two closure value primitives I’ve added some compatibility primitives for Context access that we’ll need in the Stack VM. "Note: This table will be used to generate a C switch statement." BytecodeTable := Array new: 256. "This table generates a C function address table use in primitiveResponse along with dispatchFunctionPointerOn:in:"
"NOTE: The real limit here is 2047 because of the method header layout but there is no point in going over the needed size"
(207 209 primitiveFail) "reserved for Cog primitives"
(210 primitiveAt)	"Compatibility with Cog StackInterpreter Context primitives"
(211 primitiveAtPut)	"Compatibility with Cog StackInterpreter Context primitives"
(212 primitiveSize)	"Compatibility with Cog StackInterpreter Context primitives"
(213 219 primitiveFail) "reserved for Cog primitives"
and the method that redefines it is SystemDictionary>>recreateSpecialObjectsArray. The VM’s dual of this method is ObjectMemory class>>initializeSpecialObjectIndices. We need to add class BlockClosure to the array at the image level and access it from the VM through the assigned index. Note that the image’s indices are 1-relative while the VM’s are zero-relative. Again I’ve elided code for clarity. don’t even think of playing here unless you know what you are doing." newArray := Array new: 50. "Nil false and true get used throughout the interpreter"
newArray at: 1 put: nil. newArray at: 2 put: false. newArray at: 3 put: true. newArray at: 37 put: BlockClosure. newArray at: 49 put: #aboutToReturn:through:. newArray at: 50 put: #run:with:in:. "Now replace the interpreter’s reference in one atomic operation"
"Initialize indices into specialObjects array." ClosureIndex := 4. "N.B. Called receiverMap in the image." TempFrameStart := 6. "Note this is in two places!" Now we can actually implement the bytecodes and primitives in the VM. The bytecode implementations correspond one-to-one with the methods on ContextPart above except for the pushNewArrayBytecode which InstructionStream>>interpretExtension:in:for: demultiplexed into ContextPart>>pushConsArrayWithElements: & ContextPart>>pushNewArrayOfSize:. popValues := size > 127.
size := size bitAnd: 127.
array := self instantiateClass: (self splObj: ClassArray) indexableSize: size. "Assume: have just allocated a new Array; it must be young. Thus, can use unchecked stores." self storePointerUnchecked: i ofObject: array withValue: (self internalStackValue: size – i – 1)]. The externalizeIPandSP/internalizeIPandSP pair are confusing, not to mention being a pain in the proverbial. But they have fair performance justification. The VMMaker does a lot of inlining as it translates the Slang methods to C so that the bulk of the interpreter minus the primitives, and some less frequently evaluated support functions ends up being one very large C function about 5,000 lines long. The interpreter needs to access its instructionPointer stackPointer and homeContext very often and would like the C compiler to put these in registers. Some primitives, notably the process switch, block evaluation and perform primitives also need to access these variables, since these primitives create new method activations or switch between them. The garbage collector also needs access since it may move the homeContext or the current method. I suppose one could attempt to inline everything but this might get rather unweildy. The clever hack in the current Interpreter is to have two copies of these variables, the internal variables localIP, localSP and localHomeContext, which are local to the single interpreter function, and the global varables instructionPointer, stackPointer and homeContext which are accessible to primitives and garbage collector as required. The C compiler will hopefully assign the local variables to registers since they have function scope, but this leaes the poor VM programmer with the responsbility of copying the values to and forth between the two sets of varables at the right times, and knowing which ones to access when and where. One of these times is around any allocation that could cause a garbage collection. tempVector := self temporary: tempVectorIndex. self storePointer: index ofObject: tempVector withValue: self internalStackTop. Creating a closure is a little more involved. The bytecode has to retrieve any copied values from the stack and put them in an Array. It then has to create the closure and jump around the closure’s bytecodes, just as the existing BlockContext implementation does. The implementatin is split into two functions since there is a primitive for creating closures also and the bytecode and primitive can share code. "The compiler has pushed the values to be copied, if any. Find numArgs and numCopied in the byte following. and numArgs so specified, starting at the pc following the block size and jump over that code." numArgs := numArgsNumCopied bitAnd: 16rF. numCopied := numArgsNumCopied bitShift: -4. ["self assert: numCopied * BytesPerWord <= 252." self externalizeIPandSP. "This is a pain." sizeInBytes: (numCopied * BytesPerWord) + BaseHeaderSize. self storePointerUnchecked: i ofObject: copiedValues withValue: (self internalStackValue: numCopied – i – 1)]. "Split offset := (self fetchByte * 256) + self fetchByte. into two because evaluation order in C is undefined." offset := self fetchByte * 256.
offset := offset + self fetchByte. 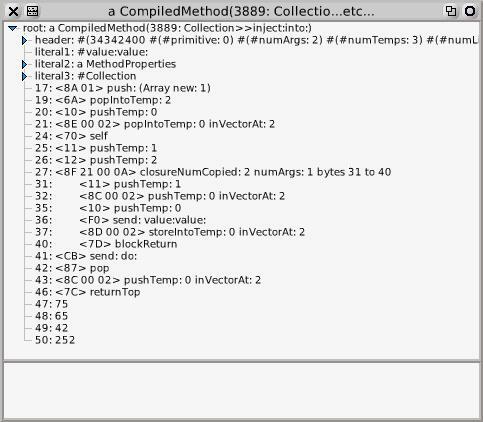 instructionPointer: ((self cCoerce: localIP to: ‘sqInt’) + 2 – (method+BaseHeaderSize)). reclaimableContextCount := 0. "The closure refers to thisContext so it can’t be reclaimed." self storePointerUnchecked: ClosureCopiedValuesIndex ofObject: newClosure withValue: copiedValues. localIP := localIP + offset. The pushRemappableOop:/popRemappableOop pairs are also confusing and a pain in the proverbial. Since, in the current Interpreter, any allocation can invoke the garbage collector, intermediate objects must be handled carefully if the garbage collector may potentially move them. The painfully error-prone solution is to require the programmer to store intermedate objects in a "remap" buffer prior to any allocation. The garbage collector updates the remap buffer if invoked. After any allocation the programmer must remember to retrieve the intermediate objects. What is error-prone is that it is not necessarily obvious when a function call might include an allocation. It is obvious for the allocation functons, but not at all obvous in e.g. primitivePerform. that calling findNewMethodInClass: will potentially cause a garage collection creating a message if the send is not understood, a bug that has lurked undetected for some time. Conseqently the pushRemappableOop:/popRemappableOop scheme is something that the StackVM is far less dependent upon. offset := self fetchByte * 256 + self fetchByte. which isn’t well-defined in C.
sizeInBytes: (BytesPerWord * 4) + BaseHeaderSize. "Assume: have just allocated a new closure; it must be young. Thus, can use unchecked stores." "N.B. It is up to the caller to store the copiedValues!" self storePointerUnchecked: ClosureOuterContextIndex ofObject: newClosure withValue: activeContext. self storePointerUnchecked: ClosureStartPCIndex ofObject: newClosure withValue: (self integerObjectOf: initialIP). self storePointerUnchecked: ClosureNumArgsIndex ofObject: newClosure withValue: (self integerObjectOf: numArgs). The primitive counterpart to the closure creation bytecode shares the above. It is much simpler since it gets its parameters as arguments. "self assert: (self stackValue: 2) == activeContext." numArgs := self stackIntegerValue: 1. "greater by 1 due to preIncrement of localIP"
instructionPointer: instructionPointer + 2 – (method+BaseHeaderSize). self storePointerUncheckedAsserting: ClosureCopiedValuesIndex ofObject: newClosure withValue: copiedValues. Then there are the two closure evaluation primitives, primitiveClosureValue & primitiveClosureValueWithArgs. We need only look at one here as they’re quite similar. blockClosure := self stackValue: argumentCount. blockArgumentCount := self argumentCountOfClosure: blockClosure. outerContext := self fetchPointer: ClosureOuterContextIndex ofObject: blockClosure. closureMethod := self fetchPointer: MethodIndex ofObject: outerContext. "Check if the closure’s method is actually a CompiledMethod." "Check if copiedValues is either nil or anArray." copiedValues := self fetchPointer: ClosureCopiedValuesIndex ofObject: blockClosure. Activating the method is very similar to activating a method for a message send (see activateNewMethod). The main difference is that closure activation pushes any copied vaues and does not initialize temporaries, leaving it to bytecodes inserted by the compiler to do that (TSSTCPW). Another simplification is that if a method or any block within it needs a large context (becaue it has a large stack) then all blocks within it do also. "Similar to activateNewMethod but for Closure and newMethod." methodHeader := self headerOf: closureMethod. newContext := self allocateOrRecycleContext: (methodHeader bitAnd: LargeContextBit). "All for one, and one for all!" "allocateOrRecycleContext: may cayse a GC; restore blockClosure and refetch outerContext et al"
outerContext := self fetchPointer: ClosureOuterContextIndex ofObject: theBlockClosure. copiedValues := self fetchPointer: ClosureCopiedValuesIndex ofObject: theBlockClosure. "Should evaluate to 0 for nilObj"
numCopied := self fetchWordLengthOf: copiedValues. call to newActiveContext: below, so we can use unchecked stores." where := newContext + BaseHeaderSize. put: (self fetchPointer: ClosureStartPCIndex ofObject: theBlockClosure). put: (self integerObjectOf: argumentCount + numCopied). put: (self fetchPointer: MethodIndex ofObject: outerContext). put: (self fetchPointer: ReceiverIndex ofObject: outerContext). [:i | self longAt: where + ((ReceiverIndex+i) << ShiftForWord) put: (self stackValue: argumentCount-i)]. where := newContext + BaseHeaderSize + ((ReceiverIndex + 1 + argumentCount) << ShiftForWord). self longAt: where + (i << ShiftForWord) put: (self fetchPointer: i ofObject: copiedValues)]. "The initial instructions in the block nil-out remaining temps." self pop: argumentCount + 1. We do have to make one crucial change to activateNewMethod and internalActvateNewMethod (because yes, dear reader, the local vs global variable scheme necessitates that there be two almost identical versions of them). Now that the VM is using the old receiverMap slot, now the closure slot, it must be set to nil on method activation. Here’s actvateNewMethod, which you can compare to activateNewClosureMethod:. methodHeader := self headerOf: newMethod. newContext := self allocateOrRecycleContext: (methodHeader bitAnd: LargeContextBit). initialIP := ((LiteralStart + (self literalCountOfHeader: methodHeader)) * BytesPerWord) + 1.
tempCount := (methodHeader >> 19) bitAnd: 16r3F. self longAt: where + (SenderIndex << ShiftForWord) put: activeContext. self longAt: where + (InstructionPointerIndex << ShiftForWord) put: (self integerObjectOf: initialIP). self longAt: where + (StackPointerIndex << ShiftForWord) put: (self integerObjectOf: tempCount). self longAt: where + (MethodIndex << ShiftForWord) put: newMethod. self longAt: where + (ClosureIndex << ShiftForWord) put: nilObj. "Copy the reciever and arguments…"
"clear remaining temps to nil in case it has been recycled"
[:i | self longAt: where + (i << ShiftForWord) put: nilOop]. reclaimableContextCount := reclaimableContextCount + 1. [context := self fetchPointer: ClosureOuterContextIndex ofObject: closureOrNil]. Voila, closures in the VM. Performance appears to be no worse than the BlockContext scheme. The VM can run old and new images alike, and mix closure and blue-book block code side-by-side, simplifying the next step in the bootstrap, which is to recompile the system using closures. Which brings us to the next post which will cover the bytecode compiler for closures. And which brings us to the code for the scheme so far. The bootstrap is in www.mirandabanda.org/files/Cog/Closures0808/Bootstrap/. Warning, this is for brave and hardy souls only, and has been tested only for Croquet.1.0.18 and Squeak3.9-final-7067. Enjoy! Posted by admin on Tuesday, July 22nd, 2008, at 6:01 pm, and filed under Cog. I disagree that “interpreting the short forms is a lot quicker than interpreting the longer forms.” It causes a lot of code duplication and icache thrashing. The best thing would be to have a simple encoding common to all bytecodes as in the specification I sent to you. (That specification has a 40% performance increase on P4 compared to the Blue Book bytecode set; probably a bit less on more modern architectures). As I mentioned in the post one representative code sample that counted all the bytecodes in the image was 40% slower when using the long-forms to do the counting than the short-forms. So it really is quicker to interpret the short forms. I think the Squeak interpreter is small enough that it all fits in cache anyway. However, I agree that given the structure of the Squeak bytecode set, those instructions are faster. One question is, why don’t you store the copied values in the indexed instance variables of BlockClosure? Do you want to ease adding further instance variables to BlockClosure? I stared doing TSSTCPW. Then I hummed and hawed over changing it but I haven’t yet accumulated any good benchmarks to determine if there is any performance difference. It is not too late to change it, and personally I prefer the use of indexable inst vars. I really really appreciate the level of detail you are willing to go into in these posts. I’ve learned a lot from them so far and I’m certain that others will as well. thank you so much for this series of posts, which I finally came around to read today. Implicitly, it’s a great tutorial on Squeak VM hacking, which I very much appreciate. In this post, I found a little glitch – just after the text saying “and now I can see what Collection>>inject:into: looks like:”, some method implementations are given without mentioning where they belong. I believe they go to ContextPart. Is that right? good catch! I had written “Collection>>inject:into: inside an <img src= … tag. Hence a lot of code was missing.